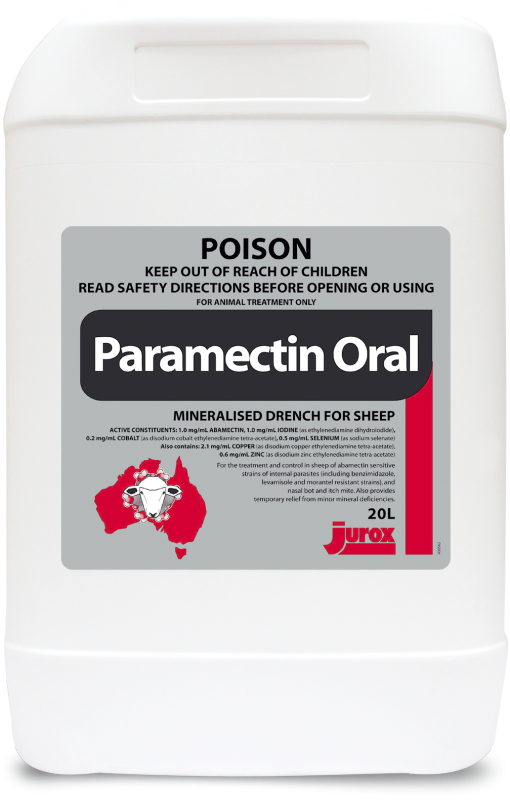 Paramectin® Oral Mineralised, designed for Australian sheep producers, contains a potent short acting ML and 5 minerals to supplement deficiencies recognised on Australian pastures, providing the protection you need. This product does not have an ESI established. For advice on the ESI, contact Jurox Pty Limited on 1800 023 312 before using this product. Dose rate 1 mL per 5 kg liveweight. Dose rate 1 mL per 5 kg liveweight. Sheep in excess of 80 kg to be dosed at 1 mL per 5kg liveweight.